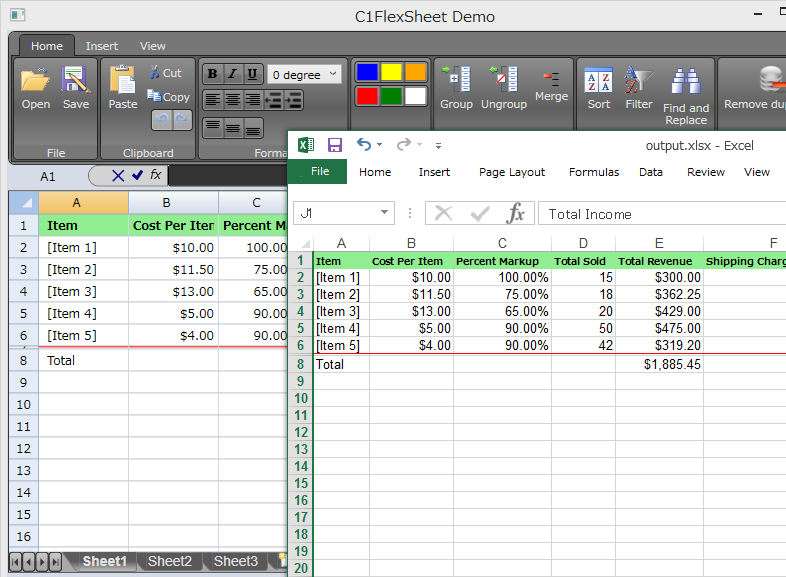 FlexSheet brings spreadsheet functionality like Microsoft Excel to WPF applications. It is inherited from FlexGrid, so in addition to the full functionality of the FlexGrid control, FlexSheet provides more features built-in such as worksheet management, a powerful formula engine, support style format, etc. Here, I will introduce the main features of FlexSheet for WPF. The entire workbook can be saved to a file that's compatible with Excel (XLS or XLSX format). FlexSheet is equipped with a flexible and powerful expression analysis engine. In addition to basic arithmetic functions it supports aggregation, trigonometric and statistics as well, so it can handle complex operations. When the entered text starts with "=", it will be recognized as a formula. The formula is analyzed by FlexSheet, and the result of the formula will be displayed in the cell. When a cell containing a formula is referenced in code the calculated result is returned. To see the formula itself, you can use the GetFormula method of the ExcelRow class. In the following example, "3.0" is returned as the value of the cell, and "= SUM (1, 2, 3, 4, 5) / 5" is returned as the formula. The format string follows the same .NET strings as the double.ToString (string) method. Insert Comments, Undo History, Print Preview and More! In addition to these features, FlexSheet offers a lot of other useful features such as insert comments and images, undo/redo history stack, print preview, etc. You can download FlexSheet for WPF as part of ComponentOne Studio. Download a C# FlexSheet code sample, and view other source codes for a variety of FlexSheet examples.